Home » 2013 » April » 11 » Seal, You Think You Can Dance? Now even a Seal can dance! The ability to entrain, which is to consistently keep beat to auditory stimuli was first discovered in 2009 amongst animals with specialization for vocal learning such as Snowball the bob head cockatoo, Cacatua galerita (Patel, Iversen, Bregman & Schulz, 2009) and Alex the African gray parrot, Psittacus erithacus (Schachner, Brady, Pepperberg & Hauser, 2009) who were able to move and peck at a target in tempo respectively. Over 6 experiments from July 2011 to November 2012, the first non-vocal mimic animal showed up to challenge the existing vocal and synchronization hypothesis which relates the ability to entrain with neural adaptations allowing auditory-vocal mimicry (Patel, 2006). 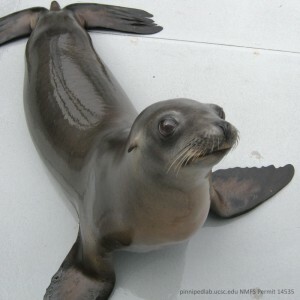 This is none other than Ronan, the female California sea lion, Zalophus californianus, who made a name for herself because of her ability to bob her head in time to a range of tempos and stimuli (Cook, Rouse, Wilson & Reichmuth, 2013). Though a first, this discovery is not unique to Ronan. Recently, it was discovered that Ai, a female chimpanzee could tap her finger in sync with a beat (Hattori, Matsuzawa, 2013). However, this study provides weaker results as it was possible Ai’s tapping was synchronized to the sound of the keyboard rather than the rhythm heard. While Ronan and Ai’s behaviours challenged Patel’s hypothesis, it may be possible that Ron and Ai are simply extraordinary individuals among their species or any animal with sufficient training could possibly be rhythmic entrained (Goldman, 2013). Perhaps someday we might find animals from across species, not just those with high cognitive abilities bobbing their heads or tapping their fingers to the beats of our favourite songs.